Move aside, music festivals! Yoga festivals are the latest trend on the festival scene, and with good reason. They’re an opportunity to retreat, focus on your practice, study with incredible teachers from all over the world, and meet an amazing group of yogis. 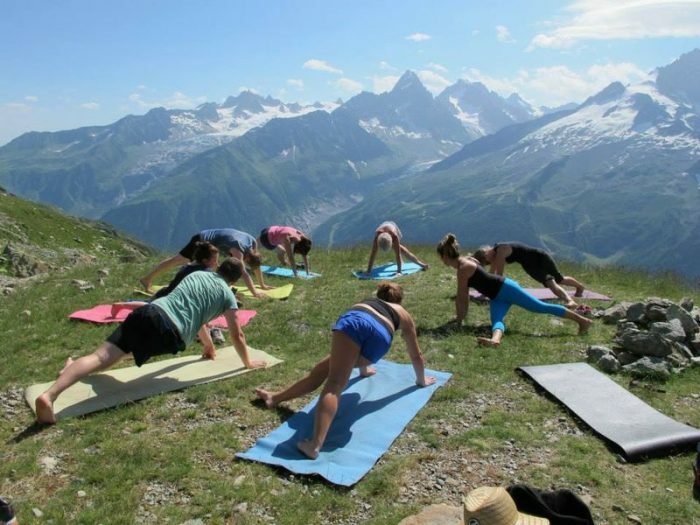 While an Alpine ski resort may not seem like the most obvious location for a yoga festival, Chamonix is actually hosting it’s fourth annual yoga festival this summer (June 30th – July 2nd). Get all the details here. Yoga classes are obviously the biggest draw when it comes to a yoga festival, and there will be plenty of those at Chamonix Yoga Festival. All three mornings of the festival begin with an hour of pranayama and meditation with Swami Buddhi Prakash. Throughout the day, you’ll have an incredible range of classes and workshops to choose from in both English and French, including acro yoga, Yin, restorative, Iyengar, vinyasa, yoga nidra, and more. Each day there are also a few yoga classes taught with live music, or you catch some of the more academic classes on topics like philosophy and the subtle body. If you choose not to shell out for full festival passes, there are even 2-3 classes each day held outside for free (weather-permitting)! When the day is over, the party is really only just getting started — and no, we’re not talking about Chamonix’s apres scene. Each night there is either a kirtan or a dance party. Kirtan artists include Daphe Tse, Prema Mayi, and Lulu and mischka. Parents, there’s good news for you, too. The festival’s Kinder Garden provides yoga classes for wee ones twice per day, so Mom and Dad can actually enjoy a session together. Finally, no festival is complete without awesome vendors and sponsors. There’s no better place to connect with businesses and products to support your yoga lifestyle. You’ll find products for sale from herbal teas to yoga apparel and more. Getting there and away: The festival is held at The Majestic Chamonix (241 Allée du Majestic, 74400 Chamonix-Mont-Blanc), a beautiful historic building in the centre of Chamonix. If you choose to drive to the festival, parking is available at Parking St Michel for a fee. Don’t forget to carpool if possible! If you’re flying, Geneva is the nearest international airport, and the quickest transfer is by road. Peak Transfer can provide a service to cater for your needs with a range of door-to-door shared and private transfers available on these dates. The festival has two recommended hotels for lodging, the Heliopic Hotel and Le Refuge des Aiglons. The Heliopic is a beautiful 4-star hotel and spa offering rooms, suites, and apartments, making it a great choice for families or groups traveling together. Don’t miss the full-service spa with a dazzling firelit swimming pool. Le Refuge — also 4 stars — is a perfect stay for the whole family, with kids’ activities, all-inclusive packages, and an outdoor pool. Of course, for the true Alpine experience, you can also choose to book a chalet. Between yoga classes, you’ll probably looking for some nourishing, wholesome vegetarian or vegan food. Annapurna is your best bet for delicious Indian food, while Munchie offers tasty and fresh Japanese. Hibou Deli is a good bet for a quick bite of homemade deli fare, like soups, salads, pies, and an assortment of international eats. For something upscale, try Le Vert Hotel Restaurant, which has vegetarian-friendly options. Don’t miss Green Soft Bar for juices and smoothies as well as Italian snacks. Whether you’re looking to diversify your own activities or entertain the non-yogis in your group, there’s plenty to keep your party active during the summer in Chamonix. Some highlights include golf, hiking, rock climbing, and biking. More of a thrill seeker? You can also bungee jump, skydive, paraglide, and go canyoning. Ready to get in on the action? Tickets are available for 1, 2, or 3 days. Discounts are available when you purchase in advance, so don’t dawdle!